Falmouth is in an area of outstanding natural beauty – built on the waterfront with its bustling streets, it holds many attractions for visitors including museums, art galleries, Art Centre and many restaurants and waterfront pubs. With its fascinating maritime history Falmouth is the perfect setting for enjoying Southern Cornwall and the Lizard Peninsula with its unspoilt fishing villages and tiny beaches. The South West Coast Path provides some excellent walks around the peninsula, much of which is owned by the National Trust. The area is recognised as being of international botanical importance – 15 of Britain’s rarest plants can be found here. Trelawney Guest House is close to the historic harbour from where various ferries, water taxis and boat trips operate to St Mawes, Truro and along the beautiful Helford River to the infamous Frenchman’s Creek. The National Maritime Museum is housed in a landmark building overlooking the water, which is the third deepest natural harbour in the world. 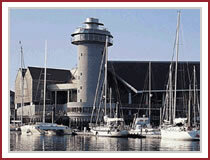 The Maritime Museum is a fitting testament to Cornwall’s close relationship with the sea. The Museum features a regular calendar of exhibitions on such themes as ocean exploration and acts of endurance, such as famous circumnavigations. For younger visitors, the museum hosts events and fun activities during school holidays. The Maritime Museum secured its place as a national attraction when it hosted the return of yachtswoman Ellen Macarthur after her record breaking round the world voyage. Pendennis Castle. This splendid 16th century castle, built by King Henry VIII, is full of history and has panoramic views out to sea and has recently become a romantic and unusual wedding venue. As Trelawney is just a short stroll from the castle it is ideally placed for weddings/functions. 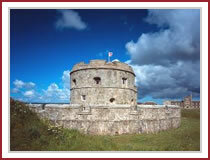 Pendennis Castle is an English Heritage property and offers a range of events for all the family. Long distance coastal walkers and cyclists are very welcome to use Trelawney as a stopover or base to explore. From Falmouth’s bustling waterfront, narrow alleyways lead to the busy world of shops, pubs, restaurants and art galleries. 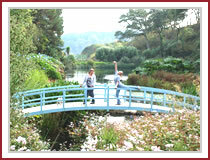 We are very close to some of Cornwall’s finest gardens including Glendurgan, Trebah, Trelissick and the world famous Eden Project and Lost Gardens of Heligan are both less than an hour away. Many outdoor activities can be enjoyed within a few minutes from Trelawney including sailing, surfing, fishing, coastal walks, golf, horse riding, swimming and sub aqua. a stone's throw from Castle Beach and the South West Coastal Path.